In this moving, witty novel, author Maureen Leurck explores the intricacies and joys of renovation and rediscovery—as one woman’s improvement project promises to transform much more than a home . . .
century-old house just a few blocks from Geneva Lake, Wisconsin. Time and neglect, along with rats and raccoons, have ravaged it inside and out. Only Alex can see the beauty of what it once was and might become again. In just a few weeks—by the time the cicadas make their scheduled reappearance after seventeen years underground—the house should be ready to sell. In the meantime, there are construction disasters, and surprises, to contend with. 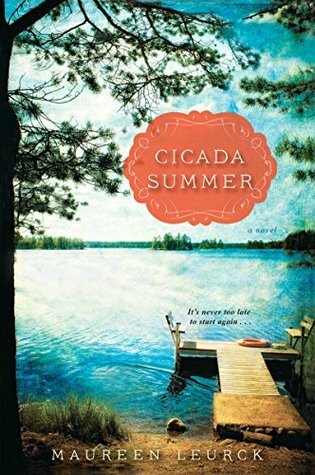 “Cicada Summer” by Maureen Leurck is such an entertaining and enjoyable story that I finished reading this in one sitting. “Cicada Summer” was published July 25, 2017 by Kensington. The genres for this story are Fiction, Women’s Fiction, with a dash of Historical Fiction and Romance thrown in. The story takes place mostly in Lake Geneva, Wisconsin. I love the way the author describes the crisp blue water of the lake, the boats, the people in this town. The timeline in the story varies between the present and past, and is described in “Cicada Years”. Every 17 years cicadas (insects) arrive for a period of a few weeks. Some people regard a “Cicada Summer” as a period of renewal or second chances. The author describes her characters as complex, complicated and determined. Alex Proctor is a single mother to a 5-year-old and has joint custody of her daughter with her ex-husband.Alex’s relationship with her ex-husband is complicated.She has problems moving forward to another relationship, and she has problems with the past. Alex befriends an older neighbor, Elise, who shares some history and secrets about the older house that Alex is renovating. They develop a friendship. Elise also bonds with Alex’s daughter. Alex’s love and job is to buy and restore damaged, old houses, and try to retain the original history and dignity of the house. To quote the author,”People keep a house alive, not the other way around,” Alex tries to envision how the house she renovates will make a home for a family to appreciate. To restore these houses requires a tremendous amount of work, endurance and stress that comes with problems. Most of these houses have dead animals, or living ones to deal with bats, feral cats, dead rodents. There is rot from water damage, The plumbing, and electrical work has to be updated to code. Alex sees this as a challenge, and tries to maintain whatever structure from the past that she can. To Alex, these house hold family secrets, and treasures. Her workers are loyal and protective. There are other people in the real estate business, that would love to tear Alex’s recent house down, and build a new house. There are major big companies that eye that land that is near the water for a new development. There is a terrible storm that causes more water damage and then a fire to Alex’s current property. How will Alex deal with these problems? But this is going to be a Cicada Summer, and with that there could be change and second chances. What do you think this will mean for Alex? I enjoyed this captivating and intriguing novel and would highly recommend it. I received copy of this novel for my honest review. I look forward to reading more of Maureen Leurck’s books.